Golf is the one sport players spend more money on trying to improve than anything else. New clubs, new grips, different balls, golf-swing machines and simulators, you name it – there’s no end to what novices and amateurs will do to improve their game. But forget all that; they’re largely gimicks whose primary purpose is to take your money, rather than improve your game and score. If you really want to improve your score, either for self-satisfaction, to impress your buddies or to win tournaments, try these 5 golfing tips; they’re simple and will do more to improve your score than anything else. Most new golfers get their grip all wrong when starting out and as this is the only connection you have with the club and in turn, with the ball, you better get it right. 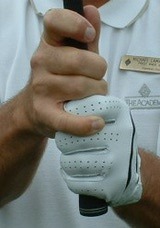 Overlapping Grip (also called the Vardon Grip): This is the most common grip amongst professional golfers. 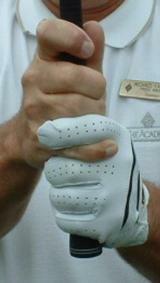 It places the club in the fingers and is the grip most likely to be taught by golf instructors. Simply place your hands on the grip, take the little finger on the trailing hand and place it between the index and middle finger on the lead hand (for right-handed golfers, the lead hand is the left). The lead hand thumb should fit in the lifeline of the trailing hand as shown. Interlocking Grip: The next most common grip is called the interlocking grip. This grip is popular with lady golfers and has been used by many top male players including Jack Nicklaus and Tiger Woods. This grip literally locks the hands together, but the golfer also runs the risk of having the handle stray into the palms of the hands. People with small hands, weak forearms and wrists, and beginners in many cases prefer this style of grip. 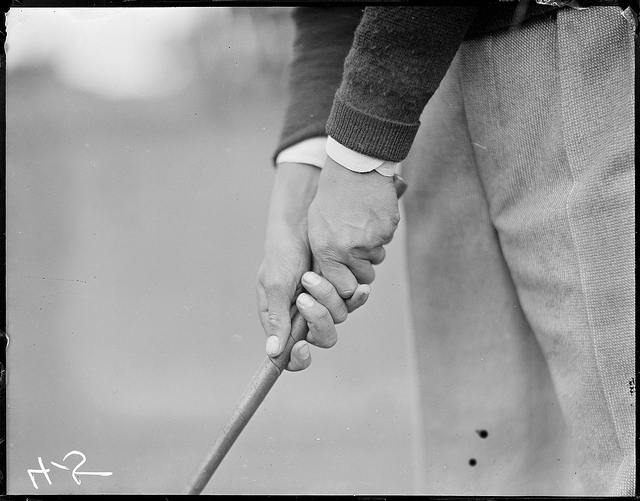 To use the interlocking grip, take the little finger on the trailing hand (the trailing hand for right-handed golfers is the right hand) and intertwine it with the index finger on the lead hand. The lead-hand thumb should fit in the lifeline of the trailing hand as shown.